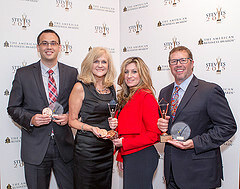 The Stevie Awards, organizer of the world’s premier business awards programs, has issued the call for entries for The 2016 (14th Annual) American Business Awards. All organizations and individuals in the U.S.A. are eligible to submit nominations to the ABAs. More than 3,300 nominations from organizations of all sizes and in virtually every industry were submitted in 2015 for consideration in a wide range of categories. Nominations are accepted in various category groups including management awards, public relations awards, marketing awards, new product awards, HR awards, IT awards, web site awards, and more. New categories for 2016 include Minority-Owned Business of the Year and Veteran-Owned Business of the Year. There are two early-bird entry deadlines this fall, November 19 and December 16. The final entry deadline is February 18, 2016, but late entries will be accepted through March 16 with payment of a late fee. The entry kit brochure is now available. For the first time, Stevie Award winners in The American Business Awards will be announced before the gala awards banquet. (To date, Finalists were announced about a month before the banquet, and they could attend the event knowing they had won Gold, Silver or Bronze Stevies, but not which, until the presentations.) In 2016, all Stevie Award placements will be announced six weeks in advance of the event, and winners can choose to come with full knowledge of what they’ve already won. Because of the change of format, the schedule for the ABAs has been compressed for 2016. In the past entries were accepted as late as the end of April, but in 2016 the last day for the submission of entries will be March 16. Judging will be conducted by more than 200 professionals worldwide in February – April. Stevie winners will be announced on May 2, and the awards presented on Monday, June 20 in New York. As in all Stevie Awards competitions, attendance of the event will not be required to win. The People’s Choice Stevie Awards for Favorite New Products will return in 2016 as a feature of the ABAs. All new products and services nominated in the competition will automatically be included in the worldwide public vote that will open on May 3. Nominated products and services will thus have the opportunity to win two Stevie Awards: one determined by professionals in peer-adjudicated judging, the other in a popular vote by the customers, employees, fans and followers of nominees.